Poor Sally a 17 year old cross breed with bad eyesight and almost deaf and suffering with dementia was being walked in Ashdown Forest. She had a little walk then went back in her buggy. She then decided she wanted to get out – so get out she did. The owners mooched along with her no more than a few yards behind. They turned round and she was gone. Thirty six hours later we were called out to help as there was no sight or sound of her despite an extensive search. Tiga got little scent from her clean blanket and off we went with the daughter of the owner. Tiga seemed to be on a track but the daughter was doubtful Sally will have gone so far. Tiga was on a jolly when a herd of deer passed under his nose and he decided to bay at full pelt in a deafening tone. 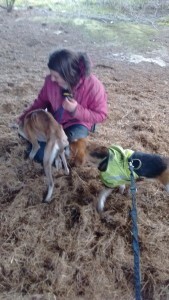 We pulled Tiga back and started from the beginning again and after a sniff of the blanket used by all four dogs, Tiga was on a new direction but again it was believed to be too far for Sally to go. The baying of Tiga earlier had clearly been heard by Sally causing her to bark to alert us to where she was. After retrieving Sally from the hole and carrying her to safety and back into her buggy, she was taken to the vet and given a clean bill of health and back home for a very much needed bath. 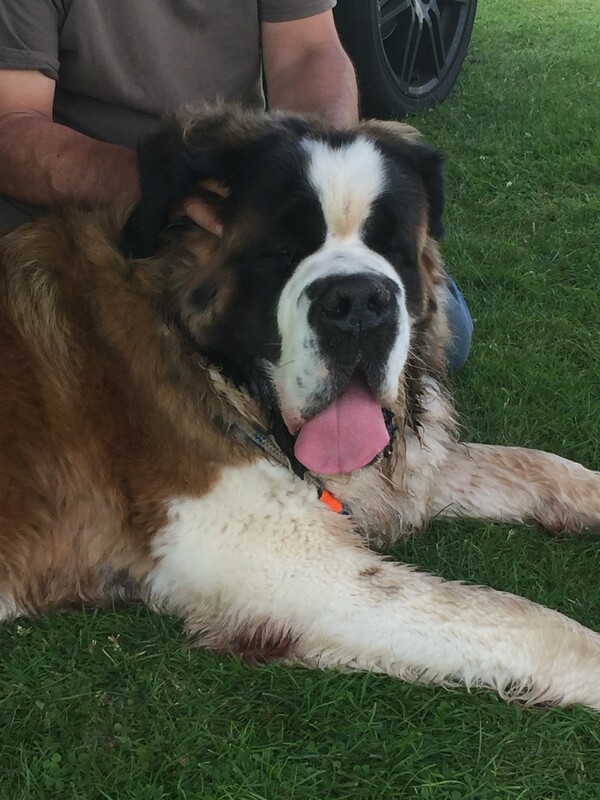 Tony a huge St Bernard weighing in at 102kgs! was on a regular and familiar walk in woodland close to home with all his buddies. Nearing the end of his walk, all his mates filed back to the van and it was soon realised that Tony was not amongst them. Where was he – how can you lose such a hug dog? But the owners had! After many hours of searching – nothing. It was time for Tiga to search and so we attempted a huge task to match Tony’s size! We arrived at the owners house to be met with a ‘large number ‘ of dogs that all shared the same bedding, toys, blankets – you name it they shared it. Unfazed Tiga took a sniff of the area where they roamed and the possible scrapings of fluff from Tony. Off we set to the point where Tony had vanished – Tiga sniffed around and sat down and looked at me as if to say – nothing here. It was only about 100 metres from where the van was parked at the end of the walk but nothing. If only dogs could talk. Tiga eventually took a different short cut to the car park but on the opposite corner and the scent stopped. We then took Tiga to where there had been reports of Tony on a busy dual carriageway. Here Tiga picked up scent and confirmed it was Tony but we had no idea how he got there as we struggled to get there on foot. Tiga tracked along a quiet lane and onto an old road with a number of businesses. We continued to a roundabout and crossed over to a regular market ground where there would have been food for a scavenger. Here the heavens opened and we called it a day. The next day the owners had a call to say that Tony had just mooched past their office into the yard of their business in the old road that Tiga had tracked the day before. 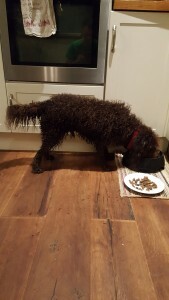 He was coaxed with water and an apple pie until owners arrived within a few minutes. Teddy a young Goldenoodle was enjoying a walk in a big forest with his family and was spooked by a big Golden Retriever running at him and off he went Saturday morning. There were a few sightings soon after but he was running scared. The last sighting was the next morning and then nothing. Tiga was asked to help and off we went. We started at the forest where he had last been seen and to much horror of the owners Tiga tracked across a very busy dual carriageway that took us fifteen minutes to cross and on into another forest that then led into the very busy town of Bracknell. Teddy had only been walked in the forest about six times and always driven there from his home some 7kms away and on the other side of Bracknell. 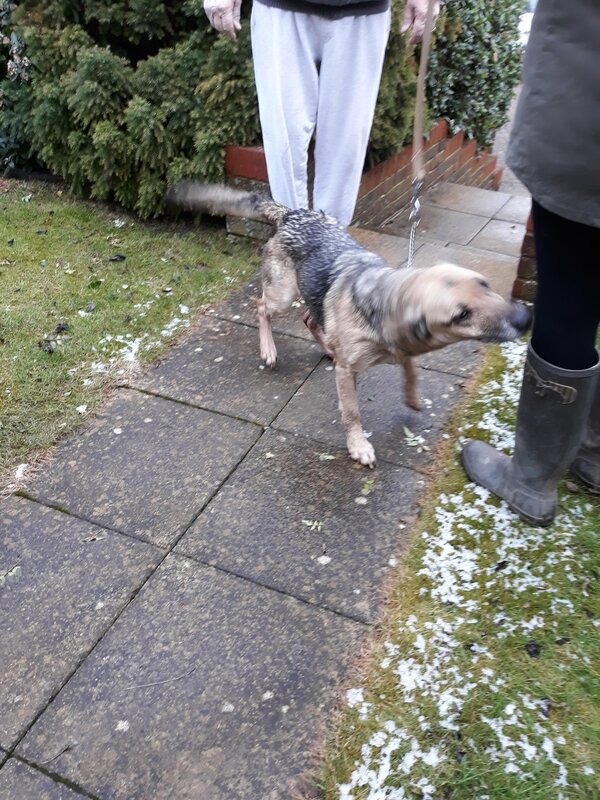 We followed Tiga who appeared to be taking the scavenging lost dog mode but into the town we went and it appeared we were heading in the direction of home, so we alerted other members of the family that were home to keep a look out. We decided to turn back and from where we were and continue back to the forest as it seemed Teddy could either have headed towards home or back to the forest and as home was covered we chose the forest. No sign back at the forest but soon after the owners returned home they had a call to say that Teddy had been seen in the road outside the forest and then again later. Owners returned but again nothing. I returned with Tiga the next day and we started from the last sightings which Tiga confirmed and then crossed the road back to the car park of the forest but not to the main car park where owners had parked. We carried on following Tiga’s nose who then led us out onto the road and over a big footbridge across another very busy road and back into Bracknell – again the same scavenging lost dog mode was evident and we got to a point where we checked our bearings and we were close to where we had been the day before. It was now getting late again and close to the time that Teddy tended to be back at the forest, so we then decided to return to the forest and sit it out. 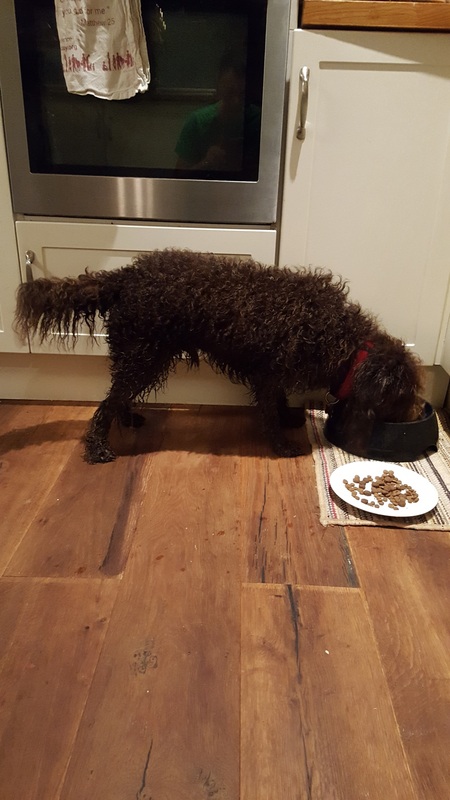 I left the owners sitting waiting and at about 10 p.m. they got the call to say that Teddy had been seen in the forest but bolted. 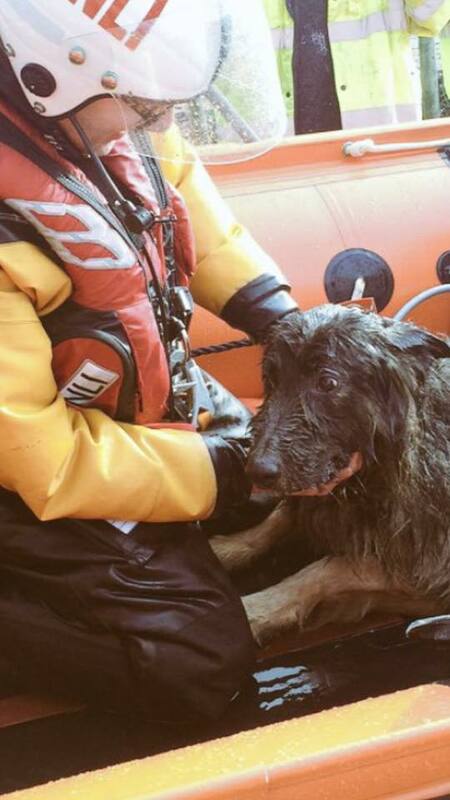 The owners searched for two more hours but nothing and so returned back home. Unbelievably at 5.00 a.m they were woken with a whining and scratching at the front door – it was Teddy! He had amazingly found his way home from the forest in torrential rain some 7kms from the forest and across a busy town he didn’t know! What a pity we didn’t continue with Tiga on the two occasions we turned back to the forest ! Bella a beagle was put in a horsebox with his greyhound buddy Cy at the beginning of a journey, when they arrived – there was no sign of Bella and the jockey door of the horsebox was open! Somewhere between start and finish Bella had jumped or fallen out. There were 3 possible sightings within an hour but two were later found to be a Labrador. Four days later despite an arm in plaster and unable to drive I just had to go and help. So I was driven down to meet the owners and Tiga was given the bedding shared by Bella and Cy and we decided to start where the third possible sighting was. Tiga started to track but instead of turning right down a lane he carried straight on along a lane which was a footpath. We carried on until we came to a gate which we could see no way Bella would get through or under. We spoke to the owner of the house by this gate and they gave us the phone number of the person who spotted Bella but with no signal we carried on with Tiga. Tiga wanted to go into this garden and down towards a slow trickle of fresh water and then back up to the lane and back in the direction we had come to where we started. This time we turned left and kept going until we came to a farm but again there was no way Bella could get through the gate. We managed to get hold of the sighter and was told that the people in this farm had possibly seen Harry but we didn’t get to speak to them, so again we carried on with Tiga. Most of the lane had secure stock fencing and so there were not many places Bella could have ventured off it but Tiga had pulled us up a drive to a holiday cottage and towards a copse full of bluebells……..and there was Bella lying in the sunshine in the bluebells watching us! Bella was safely put on a lead and I went off to find a signal to get transport to pick us up and get Bella to the vet. After a visit to the vet Bella had suffered just some very sore paws. 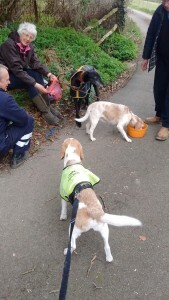 Two years ago Tiga tracked and found a beagle called Teddy and we have remained good friends since. 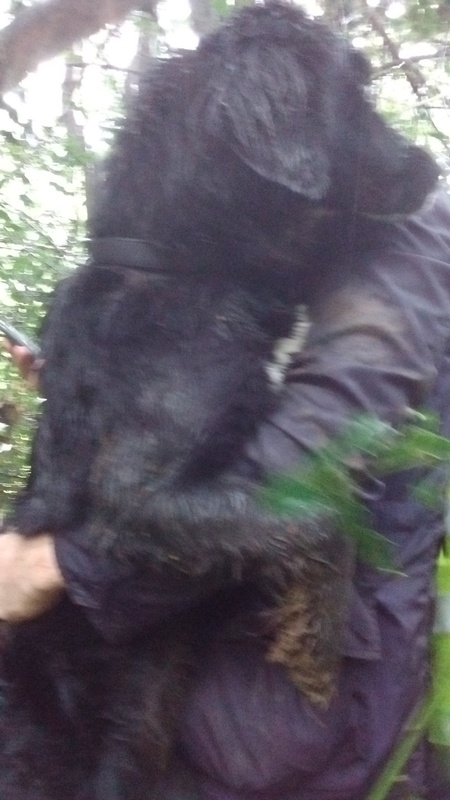 Yesterday we were in Gloucestershire tracking two missing dogs when I got a message from the owner of Teddy to say that Teddy’s brother Snoopy had chased a deer on a walk and had not returned. Snoopy belonged to some other friends of Teddy who were frantic to find him. As it happened the place I was tracking the two dogs was less than ten miles away and so when I had done as much as I could to help with the two dogs I took Tiga to track Snoopy despite many miles already having being covered. As we arrived there had been a possible sighting but Tiga couldn’t pick up the exact location which wasn’t clear from the passing cyclist, so we decided to start from scratch at the point Snoopy chased the deer. Tiga tracked from the owners parked car and headed off into the woods taking the exact route that had been walked earlier. Tiga missed a right turn up a bank which is where Snoopy was seen to chase the deer , possibly the strong smell of the wild garlic was overpowering. So we led Tiga up the bank where he soon picked up the scent again. On and on we went following an animal track through the woods and across a stream and up onto a track. Tiga carried on along the track and after a while we came out on the road where the possible sighting by the cyclist was. No sooner were we waiting for Tiga to decide the next direction we had a call from a family member saying Snoopy had just bolted past them. We were quickly on the way hardly half a mile down the road but he had again vanished. It was now dark and there was no sign of Snoopy so we were just going to put Tiga back on the trail when we heard that Snoopy had jumped in the car belonging to the owners brother. Snoopy was very happy to see his owners, his brother and Tiga and looked none the worse for his adventures of the day. Roxy, a Lakeland Terrier was on his usual walk around the grounds of the farm with his owner and buddy dog when he just vanished on Saturday morning. On Wednesday I went down with Yogi and we set off from the house and Yogi immediately had his nose down out of the garden and across the farm fields with many young lambs quite curious and playful – Yogi wasn’t sure what to make of them but stuck to his task and it was confirmed that Yogi was spot on with the route he was taking compared to the route that was taken on the morning Roxy disappeared. We eventually got to a copse alongside a shallow river with steep banks and a few entrances to a badger sett. The bramble was too dense for Yogi to track through and so I had a hunt around but found nothing. We then allowed Yogi to carry on and we followed the line of the river into a much bigger area of woodland only a few hundred yards from where we first started. There were clearly a much greater number of entrances to a badger sett and one hole in particular Yogi sniffed down and then made a noise I had never heard him make before. I moved Yogi on further but he showed no interest in any of the other entrances, so I moved him back to this particular one and again he made the strange noise. 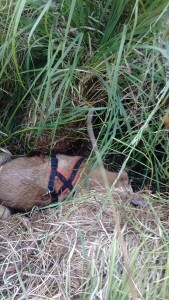 Clearly this hole was of interest to Yogi but we were unable to do anything as badger setts are protected. I advised the owner to come back with their other dog, which they did in the morning and within moments Roxy was at their feet – muddy, hungry and thirsty but otherwise ok. I just wonder what Yogi shouted down the hole! Jasper a Whippet decided to go off and play with another dog off lead while on a walk with the owner. They ran on ahead and into the bushes and brambles off the main track in a huge woodland and popular dog walking area. The other dog returned to owner a few minutes later but not Jasper. For eight days there were no sightings and so Tiga was called into action and on arriving at the woods which were now very muddy and waterlogged we started to track from where the owner last saw Jasper. Tiga tracked around the woods but generally following previous walks days before until he headed off out of the woods in the direction he was thought to have gone but not the way they were hoping. Tiga tracked onto the lane where cars were parked and down to the end turning right and to a busy ‘A’ road where Tiga went straight across and on down a quieter road into the town. We continued to follow Tiga who after a meander round the town took us onto the Cuckoo Trail – a popular walking and cycle path that went for miles. It was clear that this path and all the areas we had tracked needed to be postered in the hope of getting a sighting as were still eight days behind Jasper but this was clearly the way he had gone. After about seven hours we called it a day to try again the next. That evening the owners had a message to say that a whippet had been seen in some fields behind a service station. On looking on a map to see where this was – it was clearly feasible that it was Jasper, as the service station was very close to the woods that he first went missing on and the Cuckoo Trail went to the service area. The next day I returned with Yogi in horrendous weather conditions that we could hardly stand up in with the wind howling and the rain descending. We parked at the services and traipsed across fields in the direction of the sighting not quite knowing the exact spot. We came to some allotments and a track running past that came from the main road that Tiga had tracked across before but further down. We saw a run down barn and decided to let Yogi go in to start the search – low and behold as I went in the barn following Yogi I saw some hay and curled up in a home made nest of hay was a little whippet having a snooze. I called the owner in and Jasper lifted his head and looked across at Ella, who gently went up to Jasper with some tripe – Jasper started to eat the tripe and I handed over a slip lead to secure Jasper. Jasper was very cold and exceptionally thin but otherwise seemed very well. We carried him to teh cars and Ella got him off to the vet who told Ella that he would not have survived too much longer with his energy levels and weight. He is now doing very well and has regained his weight. Storm a huge cuddly GSD had escaped owners garden after some fences were broken down on Sunday. There were a few possible sightings but with such a big dog more were expected. We had a call for help and as owner was wheelchair bound and children were distraught we were on our way. Yogi tracked from the last possible sighting and took us up and along some popular dog… walking paths through some very muddy areas where we could see a few huge paw prints. We evenually came back down and took us into Hastings old town along the sea front. 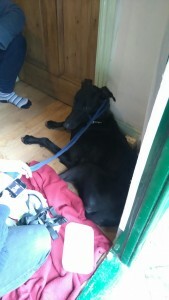 As owner thought he would not be around this area now as too many people we pulled Yogi off. We took Yogi to some woods close to home where owner believed he would be hiding. Yogi clearly had the correct trail as he went to the front garden of a house next to the woods where he had been seen. From here we continued up the road past the woods and to several places where the owners children played and on to a childrens club that the boys went to. We then got news of a possible sighting back where we were earlier and so we got there as soon as we could and spent time checking the facts and ruling out another two possible GSD’s. Clearly it sounded like Storm and so we got Yogi as close to the sighting as we could and he found a cave hidden with a mattress in. We left a small treat there and let Yogi carry on. We went back along footpaths and saw many more fresh huge paw prints, Yogi continued to find these paw prints giving each a good sniff and after doing a loop up on top Yogi brought us back down some very muddy steps with lots of huge pawprints on. We were back at the cave and the treat had gone. Yogi didnt want to stop here but pulled me through a hole in the churchyard wall, through the churchyard and towards the seafront where the steps went back up to the cave. At this point we decided that owner should sit with some smelly food and sit it out by the cave with his family. ……..at 9 this morning two workmen down on the seafront saw Storm chase a seagull into the sea, within minutes Storm was half a mile out to sea. They called the coastguard and within 5 minutes they were on the scene rescuing Storm who is safely back home being warmed up before going off to vet for a checkup. 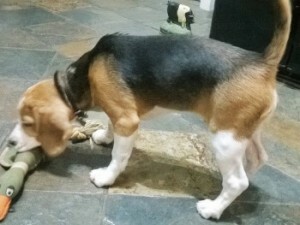 Bruno was just a young 5 month old beagle puppy that was from the same breeder as Tiga & Yogi. I was away racing with my beagles when I got a frantic call from the breeder to ask if I could help as Bruno was missing. It was New Years Eve and the owners were away from home on a family celebration. At five minutes to midnight Bruno and another friends’ dog were shut away in a room while a firework display took place. Fifteen minutes later the owners came back to the room to find the door open and the dogs gone. One of the dogs was soon found outside but little Bruno was nowhere to be seen. It was not a good time for a little puppy to be running around in an area he didn’t know and with fireworks going off all around him. 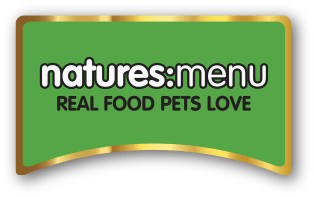 We contacted the owners to try and help by giving advice as we were two hundred and fifty miles away and couldn’t get up to track until the next day. On New Years Day the owners got news of a sighting by one of the guests as they left the venue at 12.30, soon after the fireworks. 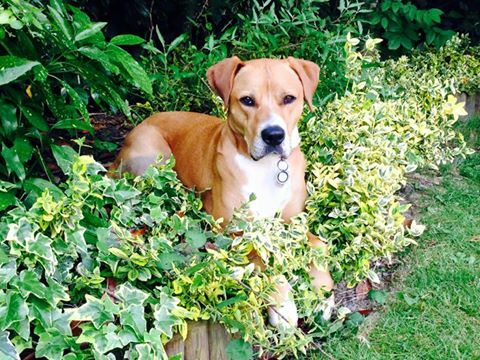 Bruno was seen running down the drive but they did not realise he was their dog. All day the owners were taking my advice and doing what they could in between entertaining guests but no more sightings of little Bruno. The next day we were making plans to travel north but just before our race I had a call to say that they had heard a howl but couldn’t be sure it was Bruno as there was another beagle in the area. After confirming it was not the other beagle I insisted the search continued in that area. Just before the start of my race – there was a sighting in the field in the direction of the howl. As soon as I crossed the finish line I had a call to say Bruno was safe. He was soon back in front of the Aga warming himself after two nights out in the wild. 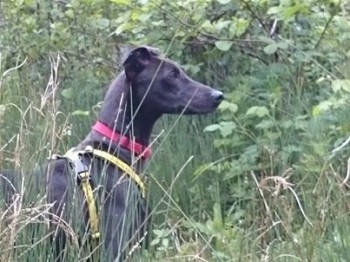 Joss was a very happily rehomed Greyhound from Kent Greyhound Trust and was on a walk on lead with the owner not too far from home just before Christmas. An off lead dog ran at him and he spooked and bolted pulling the lead from the owners hand. 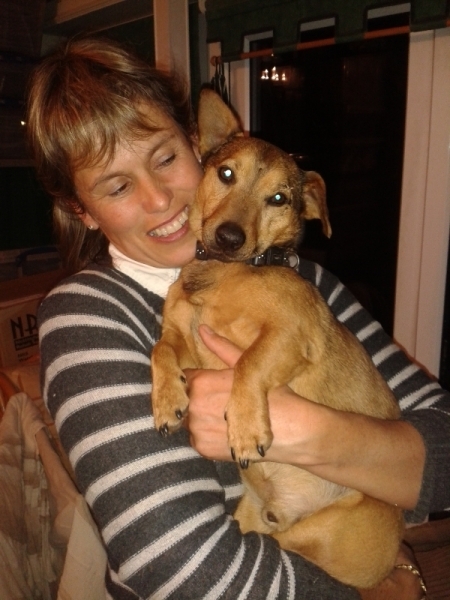 Owner was due to go on a family holiday overseas but cancelled to find her much loved dog. There were a few sightings and while a car nearly hit Joss and then reversed onto his lead trying to avoid him, the lead was caught under the tyre of the car and Joss broke free again from both his harness and lead and ran scared. There were now no sightings and Tiga was called in to help track Joss. It turned out that Joss was the litter brother of another greyhound that Tiga had successfully tracked and reunited a year ago with the help of Joss! It was now the turn of his brother to be called back to try and coax Joss back. We arrived at the owners house and using the harness that had Joss had pulled free from for Tiga to get his scent, we set off from the last sighting. Tiga was quickly on his trail and took us up and down a road that Joss had also been seen to go up and down and so we knew Tiga was on the right track. We continued to follow Tiga and eventually ended up near a school where there had been a possible sighting of a black dog but it was not confirmed that it was Joss. Tiga clearly confirmed that it was and so on we went along a busy road crossing over and on towards a huge outdoor retail shopping centre that was heaving with Boxing Day shoppers. In and out of the public we went, Tiga was undeterred he was on a mission. Tiga took us into an empty shed that had the door open and was down the middle of a shopping mall – maybe Joss had slept there the day before. We later spoke to security and that particular shed had been used to despatch Christmas turkeys to the shoppers on Christmas Eve! Joss would not have done ventured into this shopping centre on a busy day like this and we suspect he was there the day before Christmas Day when it was quiet and closed. Tiga didn’t stop for anything or anyone and took us to the rubbish bins behind Marks and Spencers and then to a number of pubs/ restaurants within the centre before finally going to the Toby Inn where Tiga spent much time circling the car park and bushes before going off again on another circuit and returning to the Toby Inn. We decided to call it a day as clearly Joss was not going to show himself in such a busy area. I got the owner to return with posters and she got a sighting of Joss on a farm immediately behind the Toby Inn! So I then asked Jill to scent from their back home. Lots of posters were put up on the route leading home and a day later a number of sightings came in. I returned with Tiga and as I arrived at the owners house again – there he was, looking up at home! Unfortunately he was being chased and off he went. We quickly got Tiga back into action but within minutes we had a call to say that Joss had run down a dead end and thumped against the door of a house which alerted the occupants and there he was – given himself up. After a trip to the vet with some very sore paws and a little lighter he was home and back in the dry safely with his very relieved owner. 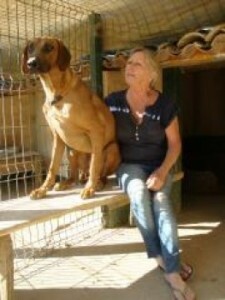 Leo is a rescue Rhodesian Ridgeback from Portugal who had spent two and a half years living with Ruth in Portugal and when Ruth’s brother in the UK recently lost his own Ridgeback, Ruth brought Leo to the UK to live with her brother. After only five days on returning to his new home after a trip out in the car he bolted from outside the house as the door was opened and with his collar and harness still on and with lead trailing. There were a number of sightings over the first couple of days and then nothing for five days. 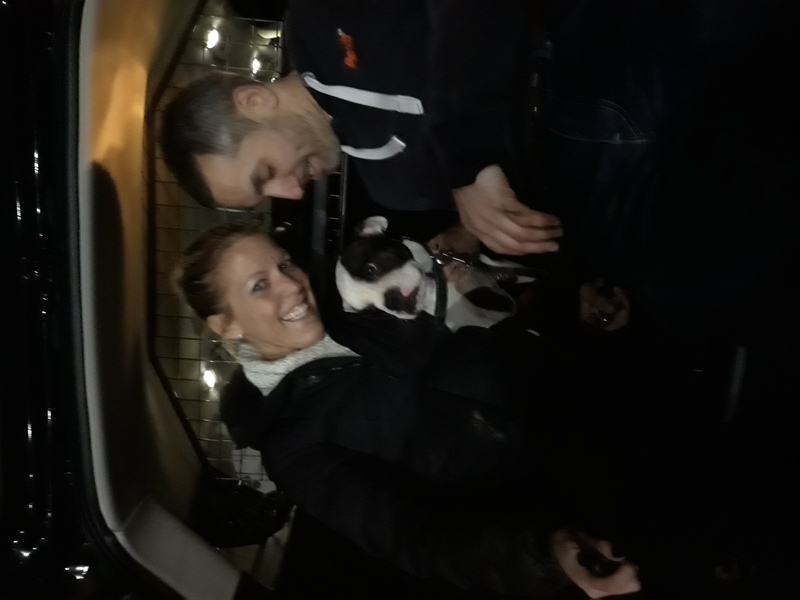 Owners were desperate to get a tracker in to help and so we agreed to help. We arrived and together with Ruth who had flown over to the UK as we believed Leo would recognise her and being a Ridgeback would more likely go to Ruth than anyone else. Tiga did not have the best scent item as it was a blanket that had belonged to the owners previous Ridgeback and was then washed and Leo had used it for five days before it was put out in the rain to entice Leo back. However after a good sniff we set off from near one of the sightings. Tiga certainly got to work quickly and confirmed that this first sighting was that of Leo. Tiga continued on for miles as you would expect with a Ridgeback and took us in turn to each of the other sightings including one that was not expected to be Leo as it was the other side of the railway but Tiga showed us the way he had travelled along a road and under a railway bridge. We continued on and on and eventually arrived at a quiet lane that took us back, this time over the railway. We fully expected to take a footpath across some fields on the other side but no, Tiga kept on the lane and eventually turning down a farm track and arriving in a village where we took a well earned rest with a swift drink in the pub on the green giving Tiga a breather before picking up on where we left off. Tiga kept up the work and we were soon back very close to where the owners lived but instead of making it all the way home, Tiga turned right and through a gate onto a path that Leo had previously been walked on. Before we turned we noticed a huge barn full of hay bales and it was the first place we had seen that Leo could have taken shelter. We decided not to enter as there were sheep in the field and electric fence around but we stood and looked around. We continued on the footpath across fields until we arrived at a large estate and garden centre and from here back onto another footpath through some woods until we arrived very close to where we started, less than half a mile from home. We decided to call it a night and that the search should continue close to home as that is where Tiga has indicated Leo was. We had covered 15 miles following Tiga’s nose and were due to return two days later if Leo was not home. The next day Leo was found by Ruth in the field with the sheep and absolutely frightened of them, still with lead trailing as he had on all the sightings. Apart from losing some 10kg of body weight he was very happy to have been found. Coco a six year old Grizzly Border Terrier that loved to chase foxes and decided that while off lead on a walk she would do just that. Twenty four hours later there was no sign of her and a friend of mine who was also a mutual friend of the owner asked if I could help. Off we went and after a sniff of the blanket Tiga set off to find Coco. It was not an easy task as Tiga had all the scents and trails of twice daily walks in the area but it seemed Tiga eventually found the last walk and continued across fields and across ditches to a pond which we circled and then Tiga just sat down. As i looked at Tiga I heard a strange little noise and then some muffled barks. I went off through the brambles to a fox hole and listened and could clearly hear a dog barking down the hole. It had to be Coco and it was. We called the fire brigade and the local hunt for some advice and in no time both were on the scene digging. Coco was soon hauled out and on the way to the vets but apart from a few minor scratches and dirt in the eyes – Coco was on her way home. 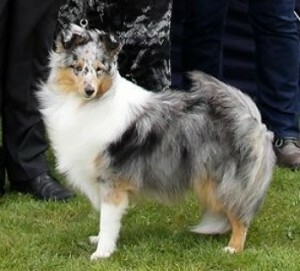 Ricky a world class Sheltie show dog was being transported from Ireland to a show in Spain and had just travelled through Eurotunnel to Calais when he was let out for a wee and slipped his collar at the service station causing an alert on both sides of the channel. The owner soon flew to Calais to help in the search but with a few sightings it seemed it would not be long before he was caught but Ricky was running scared. He had been seen back at the tunnel near some staff offices and scavenging bins. Two days later and Ricky was still on the run but appearing to stay close to the offices and car parks. 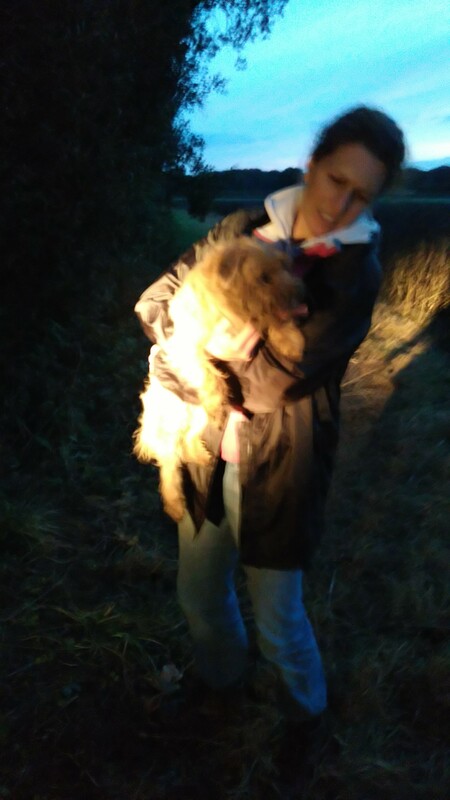 I was on my way back from tracking a dog in Cornwall when i was alerted and pulled off the motorway to speak to both the distraught breeder and owner. 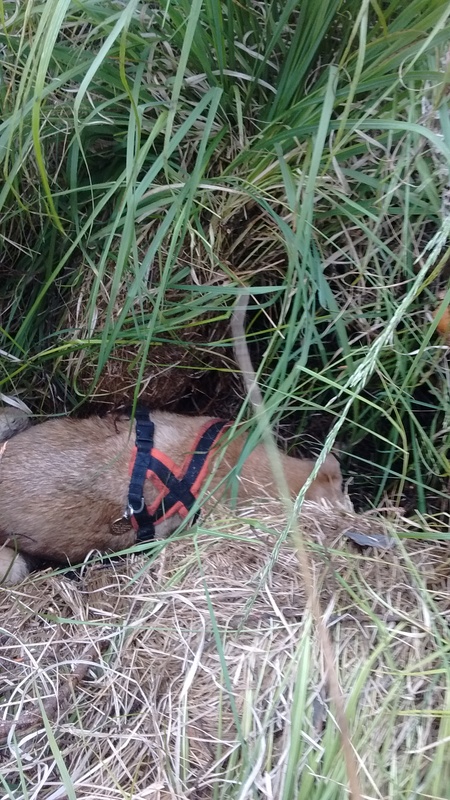 I was willing to travel to Calais if necessary to track as Tiga already had a pet passport but in the meantime I was able to offer some advice on how to catch a dog that at this stage was unwilling to be caught even by the owner. Within an hour I had calls of tears of joy from both breeder and owner to say that Ricky was safely back in his arms and that the advice given had worked. Alice a very timid beagle escaped from doggy day care and was on the run. There were a few sightings in the area but she was moving around very fast. Being a beagle, I was soon on my way with Tiga who soon picked up the scent from the field used by the doggy day care. Tiga started well as he was soon at the first sighting and onto the next, eventually completing a full circle and taking in all the sightings before coming back to the field. So it seemed that Alice would eventually be caught back here. There were a number of sightings in a nearby residential area and in particular an alleyway where she was spotted and in the gardens of the two houses at either end of the alleyway. We then had more sightings in various places around Tiga’s loop but Alice was always one step ahead. No sooner did Tiga pick up the scent and we had news of more sightings but still on the loop, so it was time to stop and sit and wait but without success. We returned again to track and started back at the doggy day care where Tiga picked up fresh scent until we had news of a sighting of a beagle with a red collar but out of the ‘loop’ but by the time we got there we found out that it was not Alice but a boy beagle that had just gone missing but quickly recaught. So again we returned to the day care to hear that she had just been seen in the woods alongside the field. I had asked the owner to leave his taxi in the car park by the field and to leave the door open. In his rush he didn’t leave the door open but only the windows as we quickly got Tiga onto the scent and clearly Tiga was on a mission. The owner decided to go back to his cab to open the door leaving Tiga on Alice’s trail and as we turned a corner out of the woods onto the track to the cab we could hear tears and screams of delight and as we looked at the cab there was Alice in her owners arms. She didn’t need the cab door open as she had leapt in through the open window and sat demanding a taxi ride home! Maisie, a Ridgeback Cross was being taken to the vet for a check up on a recent operation when she slipped her collar while being taken out of the car in the car park of the vets. She was originally a rescue and so very timid. Owners were away on holiday but cut short their trip when they heard that Maisie was missing. Tiga was called in to help track and we arrived at the vet and picked up the scent from where the daughter had seen Maisie crossing the yard of the vet. Tiga with nose to ground took us along a track and to a game keepers cottage where she had also been seen. We continued to follow Tiga across some fields and along a road and into fields on the opposite side of the road eventually coming back to the car park of the vet via a small track through a hedge. So it seemed that Tiga had defined the loop that Maisie had been doing. Maisie’s bed and toy were left in the car park of the vet and several BBQ’s were had . Tiga and I returned the next day and met with the owners who were now home from their shortened holiday. We set off again and this time we were taken on a similar loop nearby when we got news of a sighting – so we quickly got to the footpath she was seen to be heading down and let Tiga follow the scent. It seemed the path was going to take us back along the path where we were yesterday and then across the road to the vet. I suggested that the owners got ahead of us and sat on the path between the road by the vet and where we were heading. Soon after Maisie trotted quite happily along the path and past ‘mum’ who was taken by surprise. Maisie did not get as far as ‘dad’ and so had obviously gone to ground. This particular field was where there also had been a possible sighting days earlier, where Maisie had been in a garden playing with some dogs and children. We called it a night so as not to chase Maisie onto the road which was now getting busy with the rush hour. The owners went back to the house where she had been playing to advise them that Maisie was still nearby and that Maisie loved other dogs and children. In the morning the delighted owners had a call to say that Maisie was in the garden next door playing with their two dogs. Apart from being quite thin and limping on her leg she had had the operation on she was fine and was soon back to being a picture of health. Rufus was only 16 weeks old when he was being taken by the owners disabled sister for a wee walk and was set upon by a loose dog and bolted with lead attached. As a matter of urgency for such a young puppy and with lead attached we drove down the next day to track with Tiga. On arriving at the woodland car park where Rufus had bolted Tiga soon picked up the scent in the direction that Rufus bolted across the road and off into more woods and also to teh place of teh next sighting. Tiga continued to track around the woods from one side of the road to the other but always back to the car park. This indicated as expected that Rufus was hiding and still closeby. Not wanting to frighten Rufus in the dark as it was now and very late we called it a day . Further searches by friends and family were carried out the next day with no luck and so the search continued on the next day with still no more sightings. Owners were going to ‘camp out’ in the car park and were ready to call it a night again when the owners son who had been helping returned to the car park with Rufus who had run out into the road in front of him just down the hill from the car park. He safe and well and none the worse for his adventure. 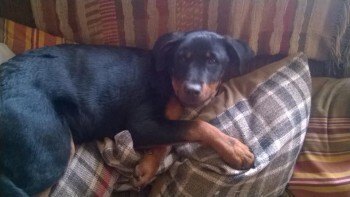 Prudence was a young 9 month old Rottweiller cross Doberman who happily enjoyed the freedom of the family farm which was secure. Sadly a visitor entered a gate and left it open allowing a young explorer to escape. For twelve days there were no sightings whatsoever despite huge searches and a poster campaign etc. We were contacted for help and we travelled to Somerset to do our best. As soon as we arrived we set off with Tiga mooching around the farm picking up scent before she vanished . We did a loop coming back to the farm which was probably her usual walk. We then picked up more scent and went through the gate that had been left open. We followed Tiga as he took us left down a farm track where he sniffed and then turned back continuing along and onto a lane and again he sniffed and turned back. This time we turned into the farm yard and across where the cows had just come from the milking parlour and returned to the field so I was amazed that Tiga had managed to track through this strong cow smell even after 12 days that Prudence had been missing. We arrived at the back of the farm and across a small grassy area to the worst nightmare – a huge open slurry pit. Tiga sniffed along the edge and then slightly down the bank and looked across to the middle with his nose in the air. He then sat down and we looked at where he was looking and there in the middle was some kind of animal rising above the surface with gas bubbles rising. We returned to the owners farm and spent probably an hour inventing a long enough gadget that we could use to retrieve what we believed was Prudence. With great carefulness we managed to drag the body of this animal to the edge and yes the worst fear was confirmed. Run free and rest in peace Prudence. Jess was a very small Jack Russell that escaped down the drive and through the gate when a visitor left the gate open. Someone suggested that we were called in to help and so we did and Tiga tracked from the gate and across to the golf course opposite. From here we went across the golf course and out through a small gap in the hedge the other side and on down the road to the local open prison where we had to get permission to track in the grounds . After a tour of the gardens we carried on back out to the road and along the road until we came to the local village via footpaths across the fields. We followed Tiga as he tracked around the village and through some woods but eventually was heading back towards home but not quite making it and we called it a day. We tracked like this for a number of days and covered a number of miles around the village and through the woods but each time seem to head back in the direction of home covering similar routes each time but in slightly different directions. This went on for days and weeks and then on one occasion Tiga tracked back along the road to the golf club and only 100 yards from home the scent went cold. 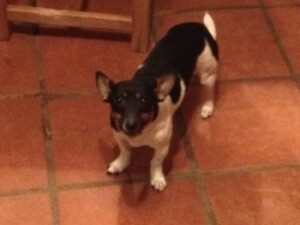 We spoke to passers by asking if they had seen a small Jack Russell and one local couple said – Oh I thought you had your dog back, we saw a young couple stop in a van and pick her up, they asked if anyone had lost a dog and we pointed to your house, they said they would go and knock on the door but they didn’t. Tiga returned to a possible sighting some days later but did not pick up any scent. It now looked as if Jess had been stolen by theft of finding. The family were heartbroken and as time went on there was no news on Jess, until……….. 15th May 2015 some 14 months later I had a call from the owner to say that Jess had been picked up some 60 miles away and taken to a vet, where the microchip revealed it was Jess! Jess was soon reunited to a very happy family and I have just got back from having a big cuddle with Jess. Never give up and make sure your beloved pet is microchipped. I was out walking my dogs when I had a call from one of the nurses at my vet, my immediate thought was oh help I have forgotten an annual booster but no it was the best friend of this nurse that had lost her dog and could I help. I quickly got my dogs home from their walk and ventured out with Tiga. Frankie was a Boston Terrier that had just had his lead and collar put on for the last walk around the block before bed. No sooner was the front door opened and he was off – he had seen a cat go by and that was something to chase. Friends, family and neighbours immediately joined in the search well into the night to no avail. The search continued the next day and there was no sign of Frankie who was still trailing his lead when he chased out of the front door. When Tiga arrived there still had not been one sighting but he soon picked up a scent and off we went. It appeared that Tiga was at this point following the scent of a normal daily walk and we soon ended up back at the front door but Tiga continued on his travels with nose to ground and carried on past the door and across the neighbours garden – clearly not the daily walk. We soon got to a footpath and turned left and followed the path round to the right stopping to sniff at a pile of rubbish where clearly some easy pickings were there to be had. Having sniffed on past the rubbish Tiga went into a parking area behind some houses and starting heading towards a back gate swinging in the wind and there with head half in and half out was Frankie still with lead attached. He soon recognised his ‘mum’ and came bundling over giving Tiga a lick enroute. His lead was wet and muddy but Frankie looked none the worse for his night out on the cat walk. 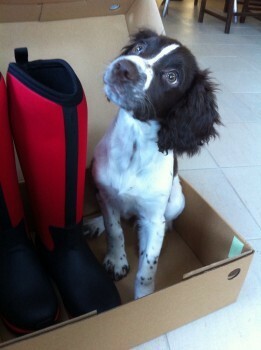 Pip a springer spaniel at just 17 weeks old was being walked early one morning off lead with the other family spaniel on the beach. 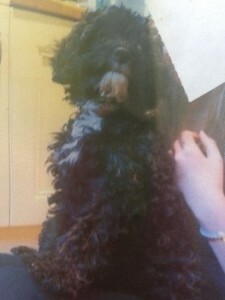 At some point Pip just vanished despite being close to owner. Extensive searches of the surrounding areas, a poster campaign, media campaign revealed nothing. Four days later we were contacted to help and we duly obliged. I met the owner with Tiga and were given the scent item in the hope of some good news. Tiga tracked along the beach but went behind some beach huts close to where Pip vanished and this appears to be where Pip and the owner parted company as the owner had walked in front of the huts. 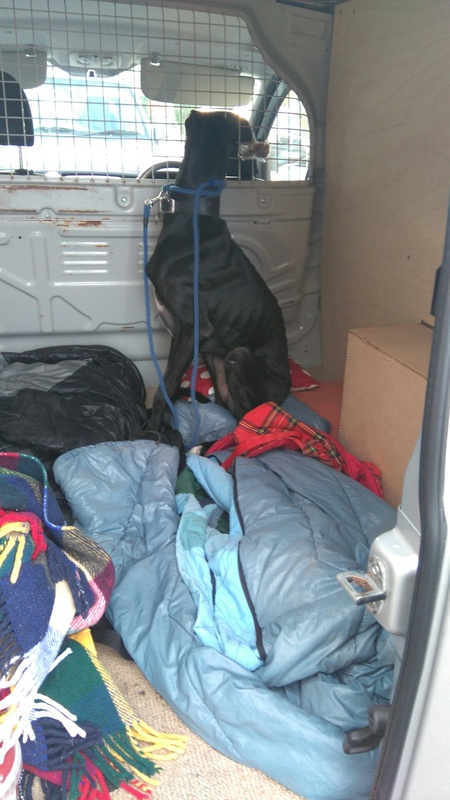 We carried on down the beach and over to the car park where owner had parked to check the crate and bedding that had been left. Tiga then picked up the scent again and on further down the beach along the promenade and up some steps leading into a building site where storm damage was being repaired. The steps went no where as there was Herras fencing across the broken steps and no way through although Tiga wanted to continue at first but he turned back and back onto the beach tracking to the section between the last two breakwaters. My heart sank as Tiga tracked down towards the sea and actually into the sea where I could see strong undercurrents. There were also signs up saying Danger bathers keep away. Although Tiga continued to track it seemed more a case of searching than tracking. We tried different places beyond the promenade and under bushes eventually going back to where we started. Tiga then picked up scent near the swimming pool and going round the building to a locked gate which we couldn’t get through but Pip could have done. We tried to pick it up the other side but no joy, probably because Tiga had air scented through the gate and not ground scented. With no sightings there was nothing more we could do except to make Pip too hot to handle. Everyone knew about Pip and were all looking out for her. Two days later there was news of a possible sighting but unfortunately only about two hours after she first went missing and in fact in the direction of where Tiga was air scenting. With a huge search planned we decided to go back down to try and pick up from this sighting. No sooner did we start to track, we had a call with the worst possible outcome. Pip had just been washed up on the beach a few miles down the coast from where Tiga tracked into the sea. Run free Pip you stole so many peoples’ hearts and although so young you left a huge impression on us all.